The Test Assessing Secondary Completion exam or TASC was designed by CTB/McGraw-Hill as a High School Equivalency (HSE) exam. This is a cheaper alternative (free in New York) to popular HSE alternative such as the GED test or the CHSPE Test in California. This test allows students and adults who didn’t complete high school to show that they have the equivalent skills and knowledge as high school graduates. People without high school diplomas can use their TASC certificate to apply for higher education or qualify for jobs that require grade 12. The testwas established in January 2014 and it is acceptable in New York, Nevada, California, New Jersey, Indiana, Wyoming and West Virginia. The test is available at different test centers in the states where TASC is approved. Click on the links below to find test sites and register online. The test is available as a computer based exam and in pencil/paper format. The exam is also available in English and Spanish versions. Students need a scientific calculator for the Mathematics section and passing score is 500 for each sub-test. The exam lasts for about nine hours and usually takes a day or two to administer. Students who fail any sub-test can re-take the test after 60 days. 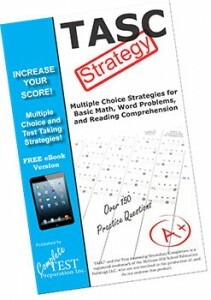 Increase your score with winning multiple choice strategies from exam experts! Learn and practice practice powerful multiple choice strategies for reading comprehension, basic math, and word problems!